a blueprint, a map on which to chart a course. 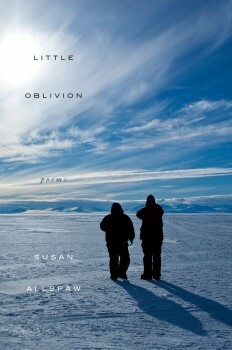 The collection which follows fulfills this promise of a poetic cartography of Antarctica, as Allspaw’s poems both swallow and are swallowed by the ice which “catches all our fallen graces in its cracks” (“Crack it Open”). wouldn’t matter, then deep water would be enough. This poem, and others in the collection, display awareness of a desire to completely write oneself onto and over the landscape, but Allspaw sidesteps this, never allowing the impressions of her human subjects to completely overcome their setting. Instead there is a reciprocity between human and land, as when she writes of “shells that once were people,” or how “women aren’t heroes-–they are the ice”. As Allspaw wrestles with the complexities of the landscape, her language seeks out different dictions and registers to express what she finds there. Some of the poems are pure lyric energy, as in “When Ice Catches Daylight, Addiction,” where “Edges like a salt lick. Snowflakes / big as father’s hands. Ice sheets/ in herds moving in front of the bow. / Like sheets how with love, they keep us / buoyant.” Others, like “Not For The Krill,” reflect the scientific undertaking of the ice station: “she will have a net filled / with baby krill and salps, ready to observe, dissect, / count. / This is not about krill or their number.” And in the midst of the lyric and the scientific are conversational accounts, how “At the Point, Michelle wears her hood / because it’s cold and no one can see her” (“Michelle at Hut Point”). These are not simple questions. Allspaw uses the sonnet crown deftly, and this poem is a microcosm of the entire collection, circling, revealing more of the topography of the ice, of the speaker, at each refrain but never claiming to find the answer, or the origin, the speaker seeks. CAITLIN MALING has published poetry in Best Australian Poems 2013, Australian Poetry, cordite, Westerly and Australian Book Review. While living in the US, she has published nonfiction in Threepenny Review and been a Yaddo Fellow. Her first book, Conversations I’ve Never Had, is forthcoming in 2015.